I know it’s been a while since my last post, so I thought I’d do some catching up with what is out there in the net related to health care in the US, and why medical tourism, if it can live up to the hype its supporters (myself included) and those whose business it is to promote it, claim medical tourism offers in the way of better care at lower cost. Earlier this week, I received an email from one of my LinkedIn groups about a report from the Commonwealth Fund on how the US health care system compares to other countries in the industrialized world. The report was originally posted in an article on the website, One Health Care Worldwide, published by Varsha Lafargue. The article, “How the U.S. Health Care System Compares Internationally”, lays out just how bad the American “system” (a la Walter Chronkite’s quote) is when compared to European and Australian health care. As seen below, The US is dead last in overall ranking, cost-related problem, efficiency, equity, and healthy lives, and health expenditures, per capita in 2011 was $8,508, the highest among all 11 countries in the report. 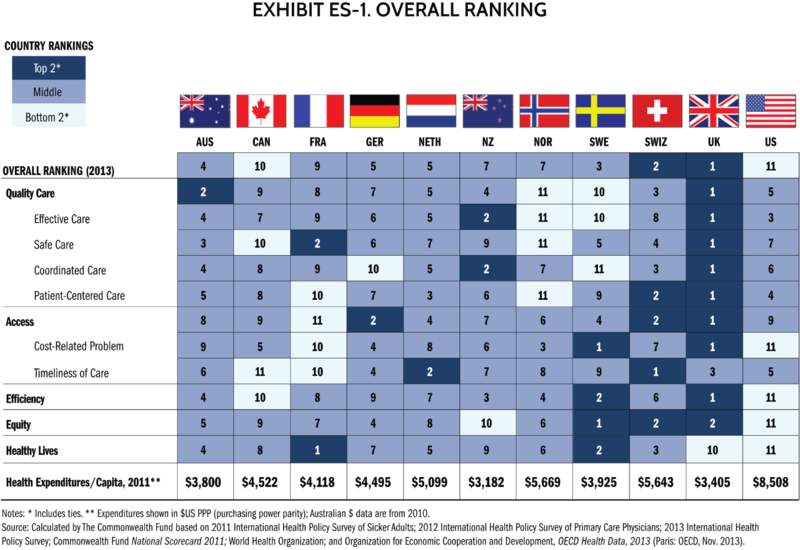 So the next time anyone defends the American health care system, or who embraces “American Exceptionalism” as an example of how better the American health care system is to that in other countries, show them this report from the Commonwealth Fund, or the chart above. And if they happen to be in the workers’ compensation industry, challenge them on the notion that injured workers are getting the best care money can buy , when as I learned recently from one such individual who was maimed, battered and is being victimized by a workers’ comp system they so strongly defend. They defend the status quo while at the same time, criticizing new ideas that will allow injured workers to get better care at lower cost without being subjected to the greed and abuse of bad doctors, lawyers, insurance companies, and laws so old and decrepit, that the only way to fix these and many other problems is to write new laws that are up-to-date with the times and that allow for innovation in how workers’ comp benefits are provided and by whom and where they are provided, even if that care is out of state or out of the country. Until health care is rightly seen as a right for all citizens, and in all circumstances, both injured workers and the general population will not be treated with the respect they deserve, and will continue to be subjected to the greed, abuse, and carelessness of a money-making machine called the US health care system. This entry was posted in Health Care, Medical Tourism, Workers' Compensation and tagged Commonwealth Fund, Health Care, Injured Workers, Medical Tourism, Rankings, Workers' Compensation on June 27, 2014 by Transforming Workers' Comp. I came across an interesting article today from David DePaolo on his blog, DePaolo’s Work Comp World. The article, Comunicación No Es Médicamente Necesario, discussed a recent workers’ compensation case in Florida that involved the right to bilingual treatment. A roofer in 2012, suffered a head injury when he fell 30 to 40 feet off of a ladder. His employer accepted the compensability of the injury and authorized treatment from several doctors, including a neurologist, Dr. Angelo Alves. The claimant objected to the interpreter, and filed a petition for benefits, seeking authorization for an evaluation by a Spanish-speaking neuropsychologist. His reasoning was that he did not want to do it through an interpreter and talk about the intimate details of his life through another person. Dr. Alves supported the claimant’s claim and testified that the claimant needed to have a neuropsychological evaluation performed by a Spanish-speaking psychologist. It was Dr. Alves’ position that having the evaluation through an interpreter was not the same as with a Spanish-speaking doctor, because the doctor could get the wrong information. However, the Judge of Compensation Claims was not persuaded by that argument. The claimant appealed, but a split panel of the First District Court of Appeals agreed with the JCC. The finding of the court was that while a Spanish-speaking provider was preferable, the evidence did not establish medical necessity. Judge Scott Makar, an appointee to the First District Court of Appeals by current Tea Party-backed Florida governor, Rick Scott, in a concurring opinion, addressed the challenges of meeting health care expectations within the limited resources of any health care delivery system. David pointed out that Judge Thomas had the burden of proof backwards and ignored the substantial evidence standard. But, he also pointed out that the majority opinion seemed to take the position that Spanish is a “minority” language, which David points out in the rest of his article, it isn’t. Before I tackle that issue, I would like to explain why I mentioned who appointed the concurring and dissenting judges, and what struck me as I read the court’s ruling in this case. Had Judge Makar been appointed by any other governor besides Rick Scott, I would have been puzzled as to why they would go out of their way to annoy a growing segment of Florida’s population such as Latinos, especially since they are sensitive to any form of discrimination against their community, such as restricting their right to vote. This is especially true of non-Cuban Latinos who generally vote for Democrats. That Rick Scott is a Tea Party-backed politician, and knowing that the Tea Party has elements in it that despises immigrants, both legal and illegal, who are usually Hispanic, Judge Makar’s opinion shows obvious Tea Party bias towards Spanish-speaking people in the state. His characterization of Spanish as a “minority” language is certainly not true to this former New Yorker who had gone through several areas of Miami, Fort Lauderdale and many other cities in South Florida and felt like I was in the minority. Also, his statement about an ideal world is typical of right-wing conservatives who are opposed to any accommodations to non-English speaking people. I say this as the grandson of four immigrants who had to learn English and had to speak their native language, Yiddish, at home amongst themselves and other family members and friends, so that the “kinder” would not know what they were talking about. And since my family also came from what was once the Russian Empire, they had to know a smattering of Russian and maybe Polish to converse with neighbors and officials of the government. But that was a different time in the US, when the National Civic Federation sponsored night classes in English to newly arrived immigrants so that they can assimilate. But it is different now with Latinos, and as has been pointed out before, the younger generation of Latinos already here, speak English and Spanish. I have had classmates in my MHA classes, and have met many others in all areas of South Florida who do. On the other hand, Judge Thomas’s appointment by Jeb Bush did not surprise me, given his dissenting opinion. It recognizes the reality of life in Florida, and in other states, with regard to Hispanics, and does not, like the Tea Party often does, seek to turn the clock back to a time in the US when only one language was spoken. Going back to David’s article, demographic research he points out, shows that the Hispanic population has outgrown that of the white population in David’s home state of California and New Mexico, as well as a few other states, according to a Pew Research Center study. The projections, David cites, are that these demographics will be reflected in the overall US population by 2040. California has about 14 million Hispanics out of an overall population of 33 million. 47% of New Mexico’s population is Hispanic, and while the white population of Texas is still the majority that is projected to change soon, as the Hispanic population growth represents nearly 64% of all population growth since 2000. Florida, by contrast, David states, has 4.5 million Hispanics, which represents 23% of the population. He notes that because workers’ compensation is state specific, relative to the overall population of the state, the decision by the First District Court of Appeals makes sense. However, that he says can change. I have discussed the issue of immigration reform and its impact on workers’ compensation and medical tourism in earlier posts, and have cited statistics about the Hispanic population growth in such articles as Immigration Reform on the Horizon: What it means for Medical Tourism and Workers’ Compensation, Immigration and Workers’ Compensation: Round Two, and E PLURIBUS UNUM: Latin American and Caribbean Immigration, Workers’ Compensation and Medical Tourism. It also occurred to me that the court that decided this recent case was the same court that decided an earlier case that I mentioned in Legal Barriers to Implementing International Providers into Medical Provider Networks for Workers’ Compensation: A White Paper. In that case, AMS Staff Leasing, Inc. v. Arreola, FL 1st DCA, 2008, the First District Court of Appeals ruled that Arreola, who had been injured loading a truck, was entitled to get treatment in his hometown in Mexico. This would appear to indicate that the court in 2008, before Rick Scott became governor, was willing to have workers’ compensation claimants get treated by physicians in their home country who could speak their language, but the court in 2014, with an appointee of Tea Party-backed, Rick Scott, ruled that the claimant in this case had no right to a physician who could speak his language, even if the claimant was seen here in Florida and not in his home country. It would appear that judges appointed by Tea Party-backed governors, especially in a state like Florida, are trying to deny the rights of Hispanic claimants to Spanish-speaking doctors. Such a ruling in light of future increased Hispanic population growth is not only unconscionable, it smacks of racism and discrimination. But David DePaolo is correct in citing Bob Dylan’s song, “The Times, They Are A Changing.” Hopefully, future courts in Florida and elsewhere will correct this travesty of justice, and when medical tourism in workers’ comp becomes a reality, evaluations by Spanish-speaking physicians will be commonplace occurrences. This entry was posted in Immigrant Workers, Immigration, Immigration Reform, Legal Immigration, Medical Tourism, Workers' Compensation and tagged Bilingual treatment, First District Court of Appeals, Florida, Hispanics, interpreters, Medical Tourism, Spanish-speaking physicians, translators, Workers' Compensation on June 4, 2014 by Transforming Workers' Comp.